This is done in a very different way than any of the other pieces. 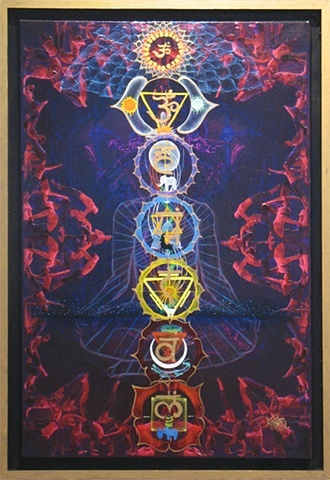 The painting has seven different symbols from seven different religions and ideologies layered upon eachother, each painted in a different chakra color. I took photos of myself in various yogic asanas and collaged them to form a pattern, glazing countless layers of color to achieve an almost mirror-like surface. The seven different symbols and colors vibrate harmoniously, each preserving their individual tone and identity. The harmony created is the universal sound, vibrating from the deep space far beyond the atomic level. It resonates through the fibers of our universe and the ripples on the waters of the unconscious form the mandalic flower of life, the sacred geometry that constructs our universal path.